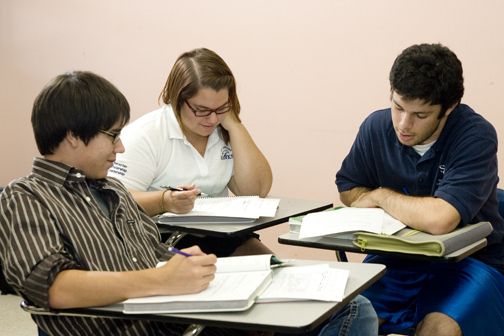 At the beginning of the period, the teacher divides the class into small groups (3 or 4) and hands out packets. Each group is assigned a different poem, which we have not yet studied, along with a set of AP-style multiple-choice questions and a free response essay question. Each group is assigned to read the poem carefully, determine its meanings, and then reach consensus on answers to the multiple-choice questions. Then, they write a comprehensive outline and/or essay response to the free response question. The teacher walks from group to group, not to answer questions but to give them thoughtful, probing questions to help them through the trickier aspects of the poems. At a designated time, the groups reconvene and present their findings to the class: they read the poem aloud, explain the reasoning behind their multiple-choice answers, and describe the logic of thesis, evidence and organization of their essay draft. Although we have studied poetry all year, these new poems allow students to think critically within a collaborative context to analyze and understand the poem, work through problems, and arrive at different interpretations. While students in the AP class are still too focused on the “right” answers, they are learning that they can analyze challenging questions by discussing them with their peers and relying less and less on the teacher’s interpretation. This activity includes oral communication, both in discussing ht poem with the group and in presenting findings to classmates, and written communication, in the form of the essay outline and/or draft. The poems themselves evoke curiosity and imagination because they resist and defy simple interpretations. AP students are trained to expect poetry to be open to multiple interpretations, but they also know that they must include clear and cogent defense of the chosen interpretation. Teaching poetry is a great pedagogical paradigm because it allows, in fact demands, keen observation, critical thinking, and imaginative reasoning. The essence of poetry engenders attention to the linguistic skill, symbolic meaning, and artistic intention of both the writer and the reader. At its heart, then, the teaching of poetry should evoke a powerful empathy for art, but it only does so through the student’s acquisition of the skills necessary to understand the art, which is at the heart of a St. Gregory English class.